/ Screenshot from an AT&T commercial. AT&T’s “5G E” service is slightly slower than Verizon’s and T-Mobile’s advanced 4G LTE networks, a study by OpenSignal has found. 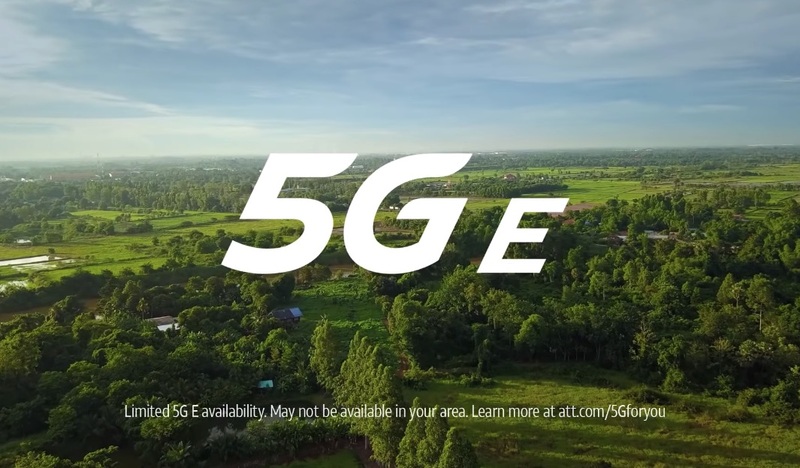 As Ars readers know, AT&T renamed a large portion of its 4G network, calling it “5G E,” for “5G Evolution.” If you see a 5G E indicator on an AT&T phone, that means you’re connected to a portion of AT&T’s 4G LTE network that supports standard LTE-Advanced features such as 256 QAM, 4×4 MIMO, and three-way carrier aggregation. All four major carriers have rolled out LTE-Advanced. But while Verizon, Sprint, and T-Mobile accurately call it 4G, AT&T calls it 5G E.
AT&T’s network name change may well trick consumers into thinking they’re getting better service than a 4G operator, but they aren’t. We already knew that 5G E has no technological advantage over LTE-Advanced, because they are the same thing with different names. But actual speed tests could reinforce that point. For each network, this shows the average speed of LTE-Advanced (“5G E”) phones versus the average speed of other 4G phones. In other words, AT&T’s 5G E speeds are typical LTE-Advanced speeds. It is a real upgrade over the older portions of AT&T’s 4G network, but that’s true for all four carriers. OpenSignal data is based on crowdsourced speed tests that can be performed by anyone using OpenSignal’s apps for iPhone and Android. OpenSignal told us today’s report is based on tests on 1,057,522 devices nationwide, across all four carriers, between January 28 and February 26. The tests don’t automatically distinguish between LTE-Advanced and regular 4G LTE networks. But OpenSignal is able to distinguish between phone models, and it compared the phones that AT&T says are 5G E-capable to those that aren’t. The resulting data thus compares LTE-Advanced phones to non-LTE-Advanced phones, regardless of whether the tests were conducted in a location where the network supports LTE-Advanced features. But all four carriers were measured the same way, and the resulting data may reflect the breadth of each carrier’s LTE-Advanced deployment. Carriers that have deployed more LTE-Advanced coverage across the US would likely get higher speed-test results than carriers that haven’t upgraded their networks to the same extent. We don’t know exactly how much LTE-Advanced coverage each carrier has. But AT&T has repeatedly boasted about the size of its 5G E/LTE-Advanced footprint, saying it covers more than 400 markets across the United States. If AT&T’s 5G E was significantly faster or more widespread than other carriers’ LTE-Advanced service, the OpenSignal tests probably would have found a big speed difference in AT&T’s favor. Instead, the results showed higher average speeds for Verizon and T-Mobile. The new results are consistent with OpenSignal’s previous testing. 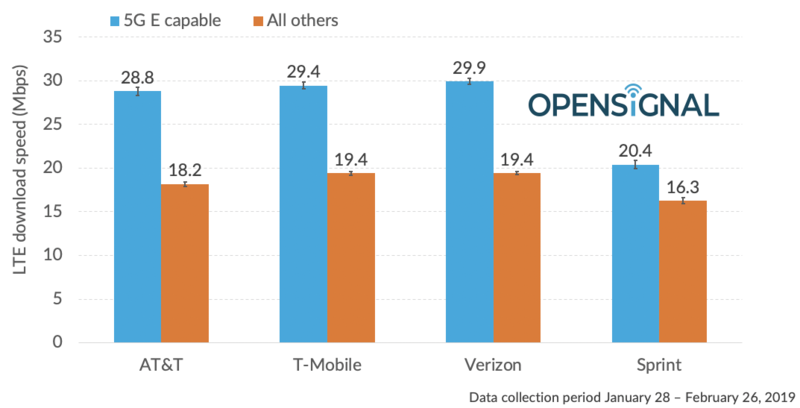 OpenSignal’s overall data on consumer 4G experiences, released in January, showed that AT&T lagged behind Verizon and T-Mobile in 4G availability, video quality, and both download and upload speeds. OpenSignal’s testing doesn’t yet tell us what speeds consumers can expect when they get real 5G. But the data shows “the extent to which LTE, or 4G, networks have improved since LTE’s original launch,” OpenSignal wrote in today’s report. Deployment of LTE-Advanced technology has created “a much faster experience than the initial version of 4G that was launched back in 2009-2011” but no real advantage for AT&T over its top rivals. If you’ve been following the AT&T 5G E story, the OpenSignal results won’t surprise you. But if you know anyone who’s confused by AT&T’s misleading marketing, now you’ve got some data to help clear things up.